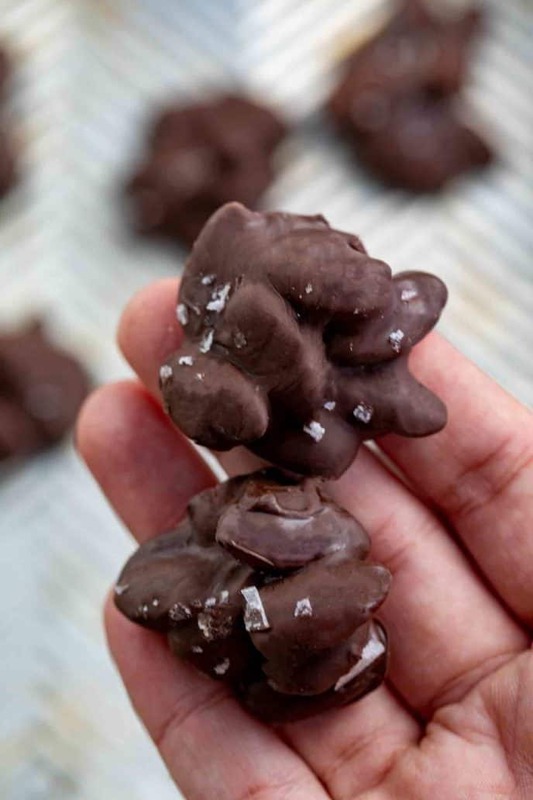 Chocolate Covered Almonds are sweet and salty, made with almonds coated in melted chocolate and topped with flaky sea salt, ready in no time at all! 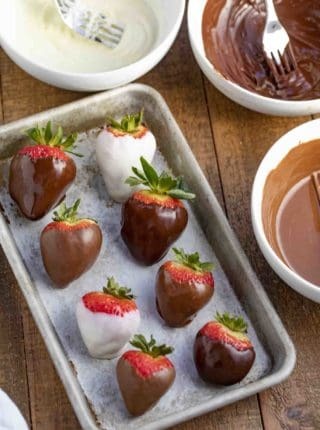 We’re getting ready for Valentine’s Day with plenty of chocolate recipes, like these Chocolate Covered Strawberries, Chocolate Covered Graham Crackers, and Chocolate Covered Oreos! 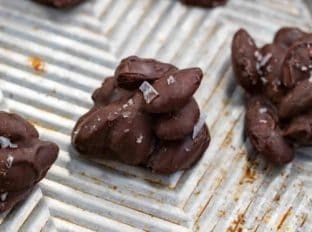 Chocolate Covered Almonds are the PERFECT sweet, salty, and crunchy dessert or snack for Valentine’s Day, plus you only need 3 ingredients to make them. These almonds are incredibly easy to make, and you can give them out as gifts for the holiday in decorative plastic bags tied with red and white ribbons. This recipe requires no baking and minimal ingredients, making it a totally kid-friendly holiday activity. 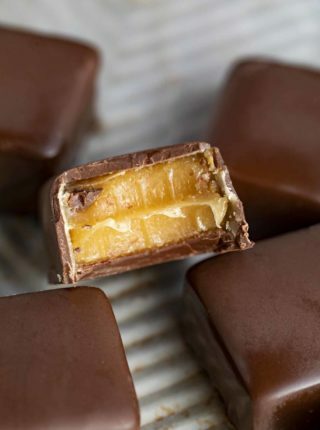 You can use dark chocolate, milk chocolate, or even white chocolate to coat the almonds. You’ll never want to buy the store bought nuts again! HOW LONG DO CHOCOLATE COVERED ALMONDS LAST? Chocolate covered almonds would last 2-3 weeks stored in an airtight container at room temperature. 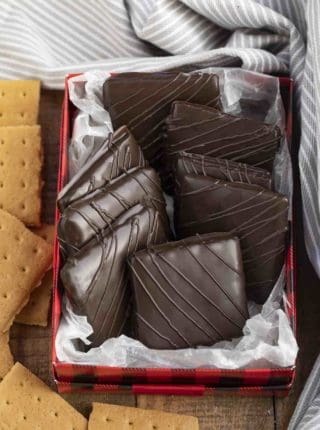 Store them with parchment paper between each layer, to keep the chocolate coating from sticking together. CAN YOU FREEZE CHOCOLATE COVERED ALMONDS? 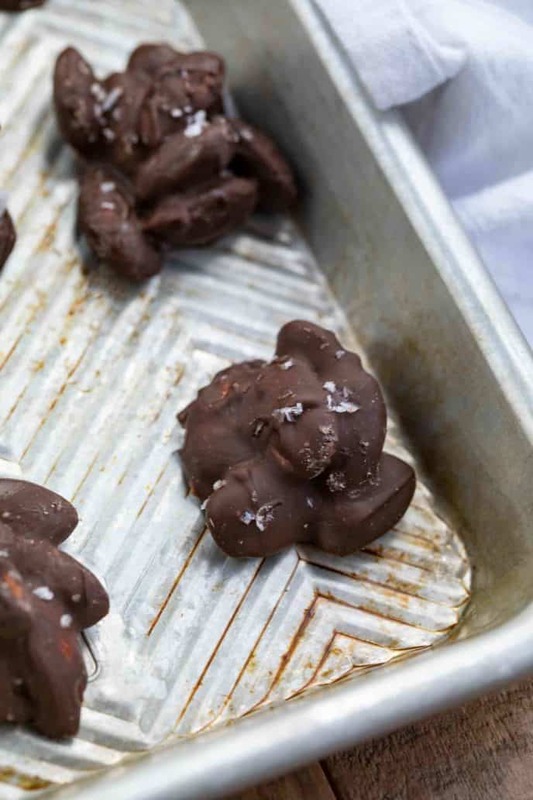 You can freeze chocolate covered almonds for a few months, but keep in mind that when a chocolate coating like we’re using in this recipe is defrosted, it can form condensation. This means the almonds may not look as pretty once you take them out again. I would freeze them for my own snacking, but if I’m giving these nuts away or serving them at a party, I’ll make them fresh. HOW DO YOU MAKE CHOCOLATE COVERED ALMONDS DUSTED WITH COCOA POWDER? Place the almonds in a large bowl and drizzle with a tablespoon of honey. Stir to coat almonds, then lay them out on a baking sheet. Sift with cocoa powder to completely coat the almond, then stir around and coat the other side (you can use regular or dark chocolate cocoa powder). Put them in the oven at 300 degrees F until roasted (10-15 minutes), then sprinkle with sea salt and serve as a snack or with desserts. If you want to make these sweeter, mix the cocoa powder with confectioners sugar, too. WHAT CAN YOU TOP THESE ALMONDS WITH? If you make dark chocolate covered almonds, drizzle with extra milk or white chocolate for decoration. 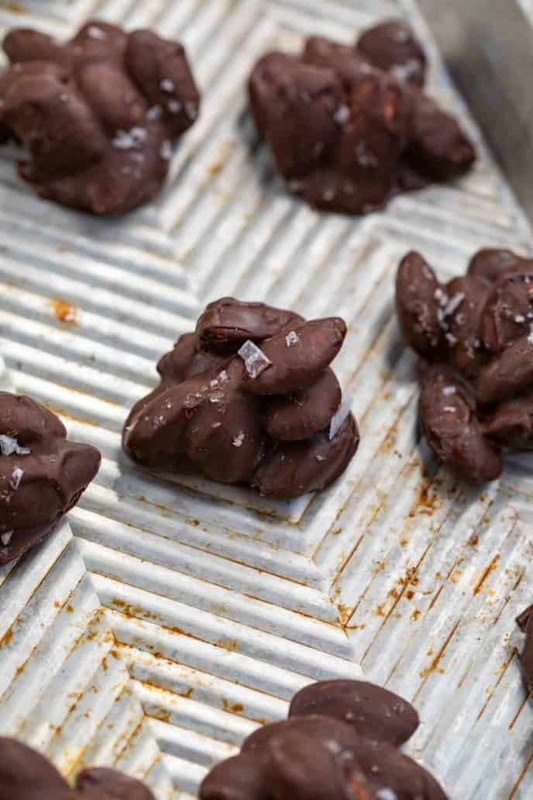 You can make this chocolate covered almonds recipe with chocolate chips, but they may not look as smooth as the chocolate disks would. You can make this recipe with other nuts, like pecans, pistachios, or peanuts. Make this recipe with roasted almonds for an even deeper flavor. Coat the almonds in peanut butter before dipping them in chocolate, similar to how we do it for Puppy Chow! Add a drop or two of coconut oil to the melted chocolate if you need to smooth it out. Add some sugar to the salt to add more sweetness to the topping, or mix it with some cinnamon for a cinnamon sugar topping on dark chocolate covered almonds. Melt the chocolate in a microwave safe bowl in 30 second increments. Dip the 4 almonds at a time with a slotted spoon, scrape most of the chocolate off the bottom of them and place onto parchment paper to harden and sprinkle sea salt over the top and allow the almonds to fully in the refrigerator. now I’m craving chocolate covered almonds!! thanks to you, I now know how easy they are to make!! 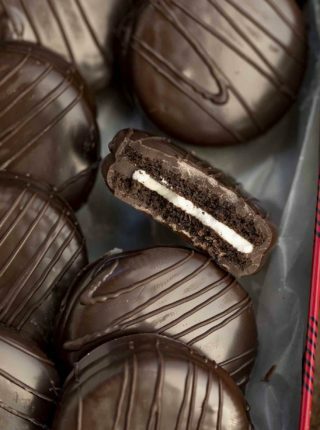 Give me all the chocolate covered treats! These nuts disappeared in no time at all! It’s so hard to stop eating them once you start! Chocolate covered almonds are my favorite! I love that you sprinkled sea salt on top…yum! Easy to make and such a thoroughly tasty treat! Such an easy and thoroughly yummy treat! Great, easy idea. These are delicious!